As Fiona “Fi” comes up to her house she notices a moving van and strangers moving furniture into her house. That can’t be right, she wasn’t expecting any furniture deliveries but as she enters her home she realizes it’s not one object but a new family moving into her home. How can this be? The couple who believe they are the new owners don’t understand what is going on but they have all the documents and are trying to help calm down Fi. She’s trying to locate her estranged husband and her children but she can’t get a hold of Bram and it looks like the set up she had with Bram, just like their marriage was all based on lies. Fiona’s marriage to Bram was pretty much over when she caught him cheating on her in their garden. Their boys asleep inside the house. That was too much but rather than disrupt the children’s lives they come to an accord, the Bird’s Nest. She’ll stay with the boys during the week and Bram can stay with them during the weekends. Meanwhile whoever is not at the Bird’s Nest, is staying at the Baby Deco, a cozy apartment nearby. What Fi never knew was that all the while she was trying to move on with her life, even attempting a new relationship, Bram had some serious issues he had been covering up. From losing his driver’s license to other greater misdeeds which he is trying to stay ahead of by lying to everyone around him. The story is split between Fi’s account and Bram’s narrative he’s put to paper. Will they get a chance to make amends to those they’ve hurt or will neither one escape unharmed by all the lies? I enjoyed the double-narrative because I got to see the action as it developed based on the other’s viewpoint. While I felt for Fiona and the mess Bram created for their family, I also was so upset about Bram. He was a character he wasn’t coming to terms with the consequences of his bad decisions. Definitely suspenseful because you want to know how this will be resolved and definitely shocked by the ending. 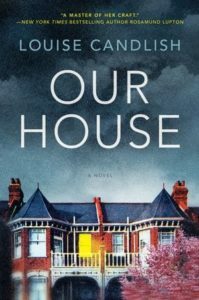 I do recommend this if you enjoy domestic thrillers. Yes, I liked this one too. Thought it was definitely different and I liked the dual telling. One can’t help but wonder ‘what would I do?’. Ha! I really enjoyed this book, though what Fi and Bram had gone through was totally shocking yet one couldn’t help but to feel sorry for them. I’m curious what the author will write next and will look forward to it. I like the sounds of this one! I’ll get it in print since I think I’d enjoy that over audio, what with the dual narratives. Wow. There’s a plot premise for you! I don’t know what it is about domestic thrillers, but I can’t seem to get enough of them. This one sounds good! I need to keep an eye out for this one, it sounds good! Thanks for the recommendation.